In today’s dentistry, dental implants have become the premier choice for replacing missing teeth. From replacement of a single missing tooth to extensive reconstruction and replacement, dental implants offer the healthiest and most permanent solution. Dental implants are the only way to replace the tooth root, offering unmatched support for a healthy jawbone and a secure anchor for new teeth that allow you to eat, smile, and enjoy life like you used to. Dental implants replace a missing tooth or teeth, are made of titanium and acrylic, and are fused to the jaw bone, replicating the tooth root. This allows the preservation of facial structure by preventing the deterioration of the surrounding bone and tissue that occurs when left untreated. Dental implants are tooth root replacements that can secure dental restorations and appliances like porcelain crowns, porcelain bridges, and serve as anchors to stabilize dentures. Dr. Thompson offers cutting edge techniques and the latest materials when preparing and placing dental implants. He has over 1500 hours of continuing education and advanced training, to ensure that you will achieve the best possible results, without having to go see a specialist. Where traditional restorations sit on top of the gums and only replace the crown or the visible portion of the tooth, dental implants replace the tooth root, which is an essential component of a healthy, functioning smile. We use advanced CT scan computer assisted planning software for precision surgical placement to ensure the best positioning for the best results. If you’re suffering from broken, damaged, decayed or missing teeth, and are trapped in a vicious cycle of root canals, crowns, and bridgework, or dentures that don’t stay put, Dr. Peter Thompson would love to help you find a secure, permanent solution with Hybridge. Hybridge is a revolutionary, lasting solution that combines dental implants with life-like restorations for a single tooth, multiple teeth, or a full mouth reconstruction. Stop treating the same teeth over and over, schedule a consultation today to find out how the Hybridge system can help you restore your smile, your confidence, and your quality of life! Traditionally, replacing a single tooth would require a bridge, which usually would require the removal of healthy tooth structure on either side to fix the bridge in place. As dental techniques and technology advance, we are always looking for more conservative approaches to help keep your natural teeth healthy and intact for as long as possible. A Hybridge single tooth dental implant not only maintains the integrity of surrounding teeth but offers all of the wonderful benefits of a dental implant at the same time. A Hybridge multiple teeth dental implant restoration looks a lot like a traditional bridge, consisting of multiple fabricated teeth in a row. The difference, however, is that a Hybridge does not require any removal of healthy tooth structure to place. A Hybridge is conservative in nature and economical as the number of teeth to be replaced increases, the cost per tooth decreases. This is because dental implants are much stronger than natural teeth, so a single dental implant is able to support several replacement teeth. We use the minimum number of implants to support the maximum number of teeth. Hybridge restorations are designed with beautiful ceramics to be strong and perfectly replicate the natural beauty of tooth enamel. A Hybridge full mouth dental implant restoration is a wonderful option for patients missing most or all of their natural teeth or living with ill-fitting dentures that rock and slip. A full mouth restoration is an implant-supported full bridge system consisting of dental implants and a full arch of beautifully secured teeth – upper, lower, or both. This gives patients all of the wonderful benefits of dental implants, and a fully functioning, beautiful new set of permanent teeth. Dr. Thompson will sit down with you in a comprehensive consultation to discuss which of the three options is best for your needs. The Hybridge full arch system permanently replaces up to 12 teeth, supported by five or six dental implants. If you have upper teeth that need to be removed, we require a healing period of 11 weeks following the extraction before the implants can be surgically inserted. We can place a temporary restoration in the meantime so you don’t have to go a day without teeth. 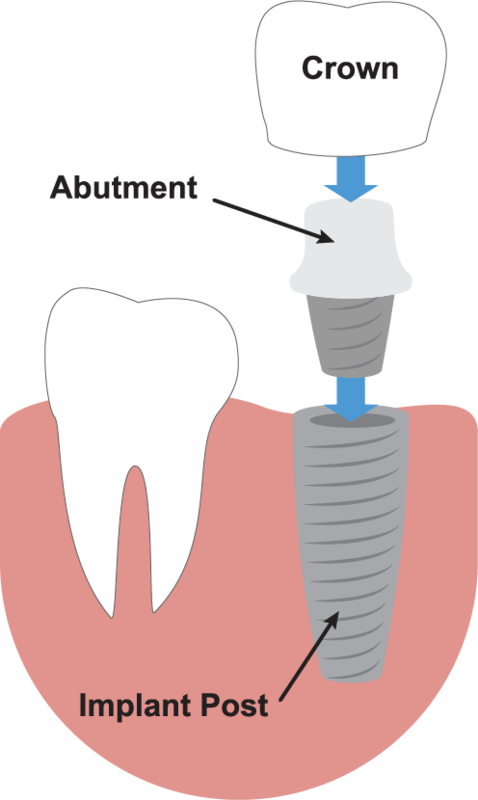 If you have lower teeth that need to be extracted, we can usually place the implants the same day as the extractions. Depending on your individual case, a Hybridge full arch can usually be completed in 5-16 weeks. Hybridge patients will always receive temporary teeth the same day their natural teeth are removed and the same day the implants are placed. Typically, the temporary teeth are in the form of traditional temporary denture that sits on top of the gums. This is a fine option for some patients, but others find the temporary denture uncomfortable and doesn’t provide the level of function desired. Hybridge Express uses a temporary Hybridge that can be placed either the day after the removal of natural teeth or 10 days later during the suture removal appointment. Hybridge Express offers patients a greater sense of comfort and function during the healing phase. Traditional dentures that sit on top of the gums are the most affordable solution and can provide a minimal level of aesthetics and facial support. Traditional dentures, however, tend to have a poor level of stability and retention, making them the least functional option. Most denture wearers tend to have more problems with the lower arch than the upper arch – a problem that can be remedied with the help of a couple dental implants. We can create an overdenture that snaps onto a minimal number of implants (at least two) for a secured solution that is more cost-effective than a Hybridge full arch system. Treatment times for a Hybridge dental implant restoration can vary, depending on whether or not an extraction is required first, and the number and location of the tooth or teeth to be replaced. The time between surgical implant placement and the final restoration placement is typically shorter for the lower jaw than the upper jaw because of the bone density (lower jaw is denser, stimulating faster osseointegration). Lower implant restorations can be completed in less than 10 weeks from placement, compared to at least 16 weeks for upper back teeth. In many cases, to replace an upper back tooth, a sinus lift bone graft is required to supplement the bone for optimal implant placement. 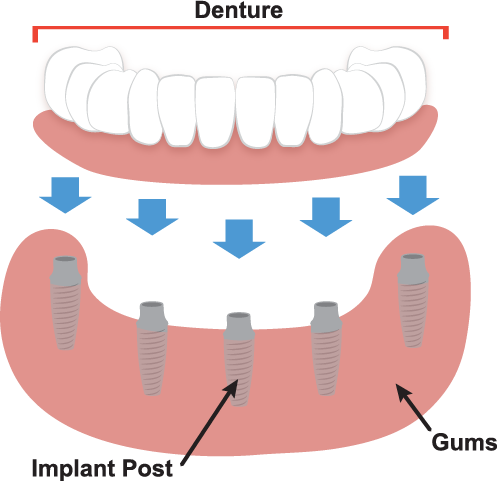 In some cases, the implant can be placed at the same time as the bone graft, but in others, a waiting period of four months is required for the final implant placement. If you have any questions about dental implants or would like to schedule a visit with your Portales implant dentist, Dr. Peter Thompson, give us a call today or request an appointment online!